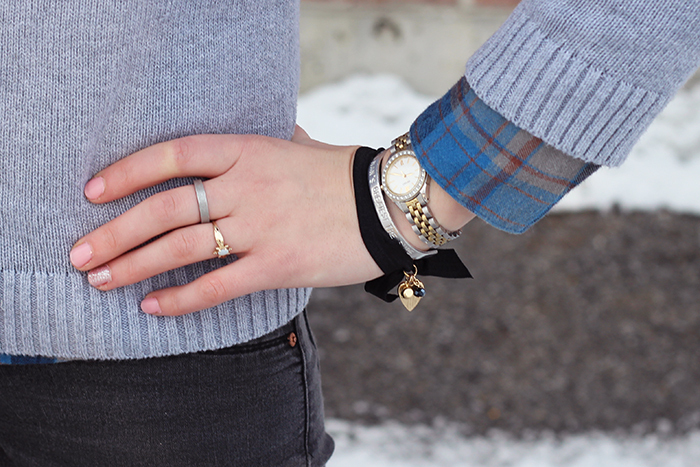 This Analog Adventure: Outfit Post: Owls! Sometimes you just need to wear a shirt with a giant owl on it to cheer yourself up in the morning. This was one of those days. I have a shirt that looks A LOT like that! :) Love it! I like how the bow tie on the owl matches the beanie. This is adorable! I love the sweater and the boots. love this look! youre style rocks! Fantastic outfit post! You are too cute. aaah, and that beenie really makes me miss long hair in the winter. Somehow, since I've cut my hair short, Knit hats like that kind of consume my head and only show my bangs. Not into it. yeah, hats are tricky with shorter hair...I would look like a man without my long hair, haha! you look adorable! I love this look! I have such a hard time layering a button up under a sweater. I feel like it looks totally chunky on me. Also - your bangs look GREAT in this picture! It makes me want to cut mine again! I've loved all (both?) the outfit posts you've done with this sweater! It's just so delightful! I love how this look is both professional and really fun! haha yep, I've done another look with this sweater. I wear my clothes many, many times so I don't want to pretend like I don't. Keeping it real, haha! Um, that sweater looks cozy and adorable and I want it. You are just too ca-ute for words!! I absolutely love your booties with the fur cuff.